Author and professor Alan Jacobs has said, “The internet is the friend of information and the enemy of thought.” We live in an age of “hot takes” and 24-second news cycles. This becomes particularly perilous when the hyperbolic rhetoric isn’t merely directed towards the latest sports story or political squabble, but a devastatingly serious crisis where the lives of human beings are in the balance. Political posturing and faux rage may be fair game when the subject is LeBron vs. MJ. However, there is no room for political posturing when innocent children are traumatized and separated from their parents. So, how might Christians respond to this cultural moment and others like it in a Gospel-Driven, Jesus honoring way. 1. Make sure the Kingdom of God takes priority over the kingdom of man. It’s becoming increasingly more obvious that many who claim to be followers of Jesus are more influenced and more loyal to their politically shaped identity than their Gospel shaped identity. Truth be told, it’s only natural. If you spend hours and hours perusing your favorite news site, whether it’s Fox News or The Huffington Post, and at best a few minutes in your Bible week after week – you will be shaped by the one you give the most attention to. If you digest stream after stream of social media and only muster fleeting moments here and there in prayer – you’ll speak like someone who gets their inspiration from pundits more than Jesus. As a Christian, it’s critical that we think like citizens of Heaven before we think like citizens of America. Nations have come and gone, but the Kingdom of God is forever. Presidents come and go, but Jesus will forever be Lord. May our allegiance be to King Jesus. 2. Make sure to honor the human dignity that every single man, woman and child was born with. Our cultural conscience is so seared that it is commonplace for memes to circle the internet leveraging sarcastic, short sited and disparaging attitudes towards the people at the border. Regardless of your stance on immigration policy, to minimize the humanity of people who are different than you is decidedly un-Christian and sinful. The irony of a Christian saying glibly, “You break the law, you get what’s com’n to you” is ironic at best and ignorant of the Gospel at worst. The foundation of Christian doctrine declares, “Praise God, we don’t get what we deserve, but instead we receive what we do not deserve!” Instead of judgment as lawbreakers, we receive grace and mercy at the hands of Jesus. Does it the nullify the rule of law, of course not. Should it make us pause, and in humble reflection ask, “Are these laws compassionate, humane and virtuous?” Certainly. Once upon a time, not so long ago, the unjust application of laws affected a large group of people born in this country. 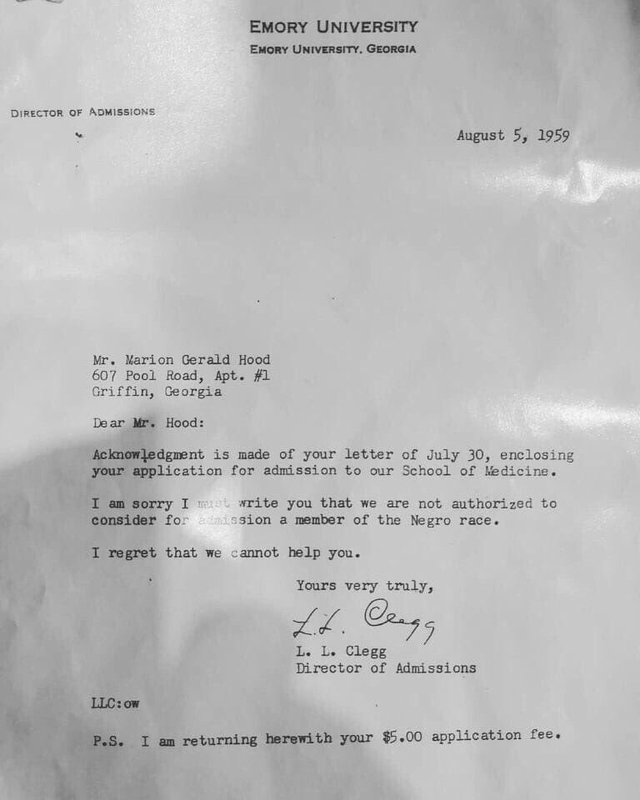 My father was the same age as my kids when this letter was written. The laws and rules in those days were unjust and needed to be changed. Loopholes needed to be closed. Unfortunately, many people hid behind the notion, “Sorry, it’s the law”. Any law that dehumanizes someone, is an unjust law and Christians should advocate that unjust laws be changed. I’m grateful that so many Christians lifted their voices so that children would remain with their parents during this border crisis. 3. Make sure to use the Bible as a scalpel to heal and not a hammer to punish. When the Bible is misused for political or financial gain, we do more than dishonestly manipulate for selfish gain – we dishonor the Author of the Word Himself. This isn’t new. For centuries evil men used the Bible to justify slavery, abuse, sexism and 100 other acts of cruelty. Let us not bear the same shame. 4. Make sure you are seeking to make a difference, not just your point. Activism is cheap these days. You don’t have to get messy or uncomfortable when signing a petition, donating $5 or liking your favorite celebrity’s quotes. It doesn’t take a lot of courage to make a few keystrokes and hit “post”. The social media age has made it easier than ever to say whatever we want. It’s easy to make a point, but making a difference is long, arduous and patient work. It will cost you something significant. Christians ought to have clean hearts and dirty hands. By that I mean to say we must live with integrity, and put our hands to the plow to do good, not merely talk. Call your elected official, mentor a kid at an under-performing school, become a foster parent, volunteer regularly with your church or charity to serve those less fortunate. You can’t do everything, but you can do something. In our current cultural climate, you’re not going to find a great deal of humility on cable news, Twitter or from the respective DNC and RNC platforms. That shouldn’t be the case in the church. Followers of Jesus Christ should ooze with self-deference, humility and civility. May we die to the flesh which prides itself on the use of sarcasm, vitriol and slander. Debating ideas is a healthy and good thing. However, a good debate isn’t just about making your argument, it’s about understanding someone else’s. As hard as it is to admit, were wrong on occasion. Over the course of life, were wrong on many occasions. Maybe a better way to begin a conversation with someone who disagrees with you is to ask, “Is there any chance I’m wrong on this issue?…Is there any chance you are wrong on this issue?” If the answer is no, it’s not a dialogue. You’ll just end up hurling insults at one another. We need to listen as much as we talk? If we’re always driving the conversation, making assumptions and speaking our minds – we miss out on some valuable opportunities to learn and grow. 6. Make sure to seek Gospel-Formed Justice. In closing, I urge us toward a faithful devotion to Jesus and His ways. Not a highjacked, counterfeit Jesus that gets used for our agenda, but the authentic Jesus as revealed to us in the Holy Scriptures. The Lamb of God who is gentle and kind to the outsider and marginalized. The Lion of Judah who fiercely opposes the self-righteous. The Sovereign King of all creation who demands our obedience and has earned our affection. This Jesus is like no other. He will not be confined to a man-made ideology. He cannot be snuffed out by persecution or any other force. His Words and life have stood the test of time and will ring on forever. In the first century, what is now called Christianity was known as The Way. Those who witnessed His death and resurrection were compelled by what He taught and what they saw. The more Rome’s oppressive regime tried to snuff out Christianity, the more it thrived. Not because it was in step with culture, or because it was corrosive to culture, but rather followers of Jesus redemptively participated in the lives of those who believed like them, and didn’t believe like them. The church became a place where traditionally marginalized people, such as women, racial minorities and the poor could find acceptance and community. When the pagan elites fled Rome because of the plagues that ravaged thousands, Christians stayed behind to care for them – knowing their ultimate destiny was already settled. May we embrace this Way. The Way of Jesus.